Pavel Bure scored three goals while four other Russians netted one goal each as Russia defeated Canada 7-5 at Megasport Arena in Moscow in the 40th anniversary rematch of the 1972 Summit Series. Dave McLlwain opened the scoring, his first of two, for Canada just over nine minutes into the game beating Russian goalkeeper Vladimir Myshkin stick side on a breakaway. McLlwain’s tally was the only goal in the first period as Canada held a 1-0 lead into intermission. After the break, Russian coach Viktor Tikhonov changed several of his lines to match up with the Canadians. His team responded by scoring five goals in the period. “It was all about coaching” Canadian forward Glenn Anderson said after the game, “he switched those lines up and they took advantage.” Bure scored first for the Russians just 12 seconds into the period. 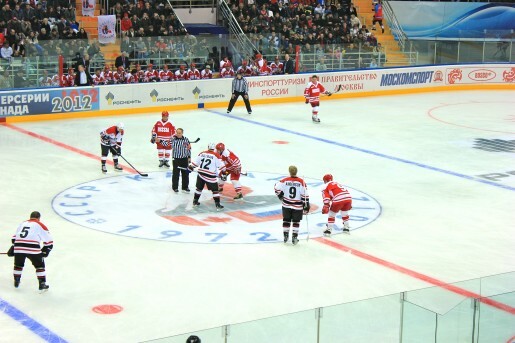 The Russians were awarded a penalty shot 30 seconds later after Andrei Kovalenko was hooked in front of the net. Kovalenko put the puck past Peter Briza to put the Russians up for good. Bure added his second of the game just over two minutes before intermission making it 5-1 Russia. McLlwain netted his second goal of the game to start the third period. His teammate Ronald Duguay followed suit minutes later to cut the Russian lead to 5-3. However, just 18 seconds later Alexander Mogilny scored the game winner for the Russians. After Bure netted his third goal of the game, Canada made things interesting with John Ronning scoring a quick goal to trim Russia’s lead to 7-4. The ensuing face-off was taken by Ronning, he weaved his way through the Russian defense and ripped a shot on goal that was barely sticked aside by Maxim Mikhaylovskiy. Greg Adams added a penalty shot goal for Canada in the closing minutes to give the team its fifth tally. Glenn Anderson also put home a goal for Canada in the loss. Alexander Kharlamov and Valeri Kamensky also scored for Russia as they got revenge for the Summit Series defeat 40 years prior. Just three members, Vladimir Lutchenko, Vladislav Tretiak and Alexander Yakushev, of the Russian team to play in the ’72 series played in Saturday’s game. Canadian great and NHL Hall of Famer Phil Esposito was the main attraction of the festivities, signing autographs throughout the first two periods though he did not participate in the game.